Aryballe Technologies' current product, the NeOseTM Pro, shown here, is a handheld device aimed at the food and cosmetics industry and is roughly the size of a barcode scanner. The nose knows when there's something in the air in a vehicle. A wire is smoking, fluid is leaking or something's rotten. But what if the nose can't figure it out? Aryballe Technologies, a French food and cosmetics industry tech supplier, is developing a sensor to identify errant smells in a vehicle. The detection system could zero in on a lingering smell from under the passenger seat or a scent arising from the engine compartment. The company's pitch to automakers at this week's WCX, SAE International's annual conference in Detroit, is that its smell sensor would be placed in a vehicle's interior to scan for scents and even detect their origin, alerting owners when there's a problem, or helping fleets stay fresh. In the case of rental car fleets or shared vehicles, the sensors would be able to tell if an occupant had been smoking or if something was spilled in the back seat. "We received demand from car fleets and manufactures who are putting cars on the streets and getting bad feedback from consumers because the vehicles were very dirty," Tristan Rousselle, Aryballe founder and deputy CEO, told Automotive News. "Just like when you rent from an Airbnb," he said. "You want to know if something forbidden was done. You want to know what the customers do, especially when it's a bad odor, which is a real nuisance." Aryballe was formed in 2014 to tackle the food industry. It was first approached about a vehicle smell-detection application by potential auto industry customers at CES in 2018, Rouselle said. Those conversations led to a project with a French automaker, which he declined to name. The Japanese home and medical products supplier Asahi Kasei Corp. is an investor in the company. 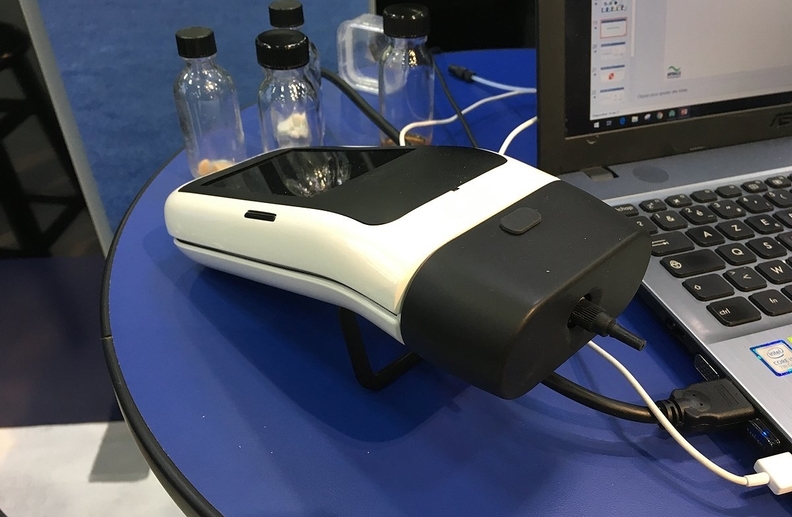 Aryballe's current product, the NeOseTM Pro, is a handheld device, roughly the size of a bar-code scanner, aimed at the food and cosmetics industry. For an automotive application, the sensor will be much smaller, closer to the size of a human thumb, Rousselle said. The NeOseTM Pro sells for around $12,000, but Rousselle said the cost expectation for automotive use will be closer to $10. Rousselle said the company is aiming for series production for the automotive industry by the end of 2020. "You don't have to push a button. Just leave it, program it, and then you adjust it, depending on the use case," Rousselle said. "For a rental car, the smells you want to know is when you get in the car and when you get out." He said the sensor can be integrated into the vehicle's interior and display its findings on the infotainment screen. For a peer-to-peer car-sharing company, the sensor could help a vehicle's owner refresh it after the vehicle is returned. The sensors could also serve an additional purpose: safety and preventive maintenance. By strategically placing the sensors throughout the vehicle, they would identify smoke, fluid leaks or other scents that indicate a brewing problem. Inside the vehicle, the idea is to place the sensors as close to the driver as possible. Multiple sensors in the vehicle could focus on the seats, the carpet and the vehicle's engine compartment.